Our fellowship began as an actual labor of love. A group of people with a common goal of seeking spiritual fulfillment in a liberal religious community began meeting in living rooms in 1979. Below is the story of our birth and growth as told by founding member Vera Dodd. Our beginning was casual; almost accidental. In a conversation with Chris Hurst, the mother of a piano pupil, she and I discovered to our mutual surprise and pleasure that we were both Unitarians, as was her husband, Phil, who joined us a short time later. As we lamented the lack of any official Unitarian Universalist presence in this area, a spark flickered and then took hold in our minds…why not start a group ourselves? This was in November of 1978, and we decided to attempt nothing until the holidays were over. Early in the new year, however, we collected a few interested friends, and about 8 or 10 of us gathered at my home to start planning. We decided to contact UUA Headquarters in Boston for any advice or help they might provide. We would also call the Reverend Deborah Pope-Lance at Washington Crossing (the nearest UU church). Finally, we passed the hat and collected about $30 to start running an ad in the local newspapers. Results were prompt and uniformly positive, except for one item contained in materials sent from Boston – a somewhat daunting admonition against attempting to start a group in a rural area – an admonition we simply ignored. In response to my telephone call, the Rev. Pope-Lance, after a very hesitant beginning, suddenly warmed up and became very enthusiastic (she gives a very amusing account of this in the video of our 1990 celebration in the Church). And my phone began to ring in response to our ad. In addition to encouraging us, the Rev. Pope-Lance also attended a ministers’ meeting from which she returned with a list of 6 ministers (including herself) each of whom would provide us with a Sunday service at no cost except travel expenses. So for the rest of that year, we held randomly-scheduled meetings in people’s homes and by the end of the year we had a mailing list of eleven families. 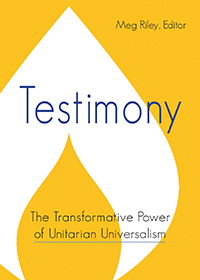 As 1980 rolled around, we decided we were ready to move on – i.e., affiliate ourselves (if possible) with the UUA. To do this, we learned we had to have 1) By-laws, 2) officers, and 3) a Statement of Purpose. Assisted by samples from the UUA., Phil Hurst and I put in many hours writing our first set of By-laws; we elected our first slate of officers, and the group agreed on a Statement of Purpose. At that time, ten people were required to sign the application for Fellowship (25 were necessary to become a church). So we sent off our application with the completed paperwork plus the $40.00 application fee and held our collective breath. During 1979, the Rev. Pope-Lance had spoken to us at the Felders’, as had the Rev. Scott Alexander, (minister of the Plainfield UU Church) at Jo French’s. Now the Rev. Jan Knost had agreed to come to us on April 27, 1980. The meeting was to be at my home, and he arrived with a gift of used hymnals from his church in Summit. What a service that was! From those hymnals (now “ours”) we sang “For the Beauty of the Earth”, and, speaking from a portable lectern and wearing a robe, the Rev. Knost announced that he had returned the night before from Boston where he had attended a meeting at which we’d been voted in as a Fellowship in the UUA! We’d done it! We soon realized, however, that there was still much more to do. We had no regular meeting place, and we had interested families with children for whom they wanted religious education. We needed larger quarters where we could meet regularly. So we began what proved to be a long and frustrating search. Velma Harrison and I had volunteered for this task, which went on for months with every lead ending in our being turned down. UUs were largely unknown in this area and what little was known marked them as decidedly peculiar if not downright suspect. Finally, well along into the summer, someone suggested we try the Kingwood Grange. To our utter astonishment, they were delighted by the idea. Their membership was dwindling and the $35.00 they asked for our two meetings per month would help them enormously. Certainly as a monthly fee it was not excessive, but our only income was from passing the plate twice a month, and while we had many interested people, our regular attendance was not very large and not all that regular either. But after much talk and soul and personal budget searching, along with not a few sleepless nights, we decided to go for it: $35.00 per month for ten months ($350.00). It was a leap of faith. Our first, and we took it. After all, my phone still kept on ringing! Although ideal for the Grange’s purposes, their building was hardly what one would associate with a house of worship. More or less oblong in shape with a curved roof and cement floor, it was divided crosswise into three sections, each extending the full width of the building. The first was a lounge with restrooms at one side; next came a meeting room that took up a good 2/3 of the building and had a stage at the far end; and beyond that was a kitchen with enormous ranges, sinks, etc. suitable for preparing and cooking the big dinners they served from time to time. The meeting room was decorated with flags, framed certificates and awards and racks of folding chairs–hardly a church like setting. However, we told ourselves that as UUs we didn’t need a spiritual atmosphere, we created our own spirituality. In short, it was a home, and we were happy there. On September 21, 1980, we held a service celebrating the founding of the Fellowship. It was a gala event with both the Rev. Deborah Pope-Lance and Rev. Jan Knost participating in the ceremony, which included a child dedication as well as a charge to the Fellowship, followed, of course, by a coffee hour with special refreshments. A week or so later, though, we were devastated to learn from Phil and Chris Hurst that they were leaving the area and moving to Maryland. Our President and our Treasurer–in fact, two of our founding and most dedicated members! However, by now, we had grown a good deal. We had an R.E. group directed by Mary Lou Crabtree and met regularly twice a month with a fairly well-established order of service. So while the Hursts’ departure would be a serious blow, it needn’t be a fatal one. We held a meeting, and I was made President, with Jim Opfell as Treasurer (as I recall) and on we went. As cold weather set in, we realized that the Grange folks had good reasons for not meeting in winter. The cement floor was frigid, the building itself not very warm, and the water pipes leading from the kitchen to restrooms were uninsulated so they were drained and water was shut off during those months. Oh well, upward and onward! People brought rugs or cushions for their feet; someone provided a porta-potty for one restroom, and we brought in gallon jugs of water for coffee and tea. One Sunday we stopped the service midway and ran laps around the room to warm up, and another time we tried meeting on the stage with the curtains drawn to conserve what heat there was. Along about then, someone called the Grange representative who promised to have the heating system checked. After all, there was a sizeable oil burner back at one end of the kitchen, and we could hear it purring along with its unfulfilled promise of warmth. A call came back to us with an apology along with a comment from the Grange member who had checked the ductwork: “Those Unitarians must really be a hardy bunch. The ducts were so clogged almost no hot air could get through them. It was real cold in there!”. While that didn’t warm the floor, cleaning out the ducts certainly made the building more comfortable. Another problem was the pianos. The Grange contained two upright pianos, one on the floor of the meeting room and another up on the stage. Neither was in the prime of life and between them they might have added up to one mediocre instrument, but age, neglect, and wide fluctuations in both temperature and humidity had taken their toll to such an extent that one Sunday after church when Susan asked why in the world I’d slowed the hymns down to such a dragging pace, I explained that so many of the keys stayed down that I had to give myself time to flip them back up in order to play them again! All this time, my telephone continued to ring—partly because of our ad, which we had kept running, and partly due to an apple communion service we’d held as part of a fall festival and which had received excellent publicity. The next five years saw us continue in the same vein; steady growth, the R.E. meeting in both the kitchen and the lounge, occasional ministers but the majority of our services conducted by members or friends. Then, just as we were once again feeling the need for more space and—dare we think it?—permanency, the Grange people notified us that their membership had dwindled to where they could no longer afford to keep that building; were we interested in buying it? As always, we had no money and besides, no alterations could make the grange hall into anything much more than the strictly utilitarian building it obviously was. We needed a church. An item in the local newspaper caught my eye. It concerned a group of people who had attended the Oak Summit School and had now purchased it and were restoring it. I mentioned the article at a board meeting and voiced my wish that we could find an old church we could restore. Mabel O’Brien spoke up immediately, saying that she knew where the school was and in fact there was an abandoned church next to it. She knew the person to call and would inquire about it if we wanted. Mabel was our secretary at this point, and she and her husband, @!$#, an attorney, had joined us during the Grange years. In a few days, we were overjoyed to learn the results of her call: the church was owned by the Cemetery Association, it was for sale, but they had turned down several offers from people who wanted it as a residence since they felt it should remain a house of worship. We could have it for $5,000. Although the price was certainly ridiculously low, we not only didn’t have any part of that, but the building would need extensive repairs. There were holes in the roof, holes in the ceiling, and holes in the floor; windows were broken and some even boarded up. There was no heat, no septic system, no running water, and what paint remained on the walls was an unbelievably awful shade of blue. The entire inside would need repainting, and the pews would need to be refinished. All this would cost money—much more than the purchase price. But we not only wanted that church, but we also needed that church, and we agreed to buy it. Once again, we took a leap of faith. After signing the deed, I went into the church alone one day and sat for a while. There was no question—that church, holes and all, had an atmosphere about it and that church was meant to be ours. And now, in fact, it was. People pledged money, and we got a loan from the UUA in Boston. Members and friends turned to and refinished pews and did whatever else they could, and the schoolhouse people offered the use of their outhouse and water from their well when the pump wasn’t frozen. They also agreed to our renting the schoolhouse for our meetings until the church was ready. And @!$# O’Brien did all the legal work free of charge. Finally, we were given our certificate of occupancy. We held a shower for the church, and people brought supplies of all kinds, and in September 1989, we held our first meeting. It was conducted by the Rev. Cynthia Ward, who had been appointed our consulting minister for the years. Once again we had taken a leap of faith and landed on very firm ground! By the time we held our first meeting in the church, it looked vastly different from the building we had bought. Our first step in its restoration had been to hire architect Paul Felder (one of the original ten who signed our application for Fellowship) for professional guidance on keeping the integrity of the building. He, in turn, recommended builder Bob Holt to do the repairs which included an outstanding job of making new frames for the broken or missing gothic windows. Also, recent member Sally Milner, an architecture historian, lent her expertise regarding ascertaining and duplicating original colors of paint and stenciling. As much as possible of the work was done by members and friends spurred on by pride in ownership as well as a vision of the future and the knowledge that we were putting down strong roots for that future. We had been given a non-working parlor organ which my family (Sue and Chuck Meacham) and I had had restored in memory of my late husband, Arthur Tiffany Dodd. We had also been given a bright Chinese red Tom Thumb piano which was quickly painted to match the pews. And we now had heat and electricity though still no running water and no sanitary facilities other than the school’s outhouses. Our consulting minister for the year, the Rev. Cynthia Ward, conducted the first service to the accompaniment of the gentle wheezing of a slightly asthmatic coffee maker at the back of the church, where the social hour was held later. Having Rev. Ward preach twice a month provided a sense of continuity that had begun by the Rev. Art Severance filling that position the previous year when we still met in the schoolhouse, and that along with the church building certainly contributed to our steady growth, slow though it was. Notes from the annual meeting in February mention that at that meeting it was moved that we install a telephone and acquire a post office box. By such small steps did we move from our infancy towards adulthood, and we rejoiced at each of them. In April, we celebrated our tenth anniversary and held a church dedication. The Rev. Deborah Pope-Lance was the featured speaker. The February newsletter had contained a President’s Message asking for help for that event and had concluded with “This is a very special occasion for all of us, and for those who remember our earliest days when we met only occasionally in homes, it is an almost unbelievable one. We’ve come a long way!”. So ended our first year in the church. The following year brought us The Rev. Donna DiSciullo as consulting minister and at the annual meeting, Tim Carr was elected President of the Fellowship, following my resignation after having served a little over ten (10) years. (Please note: I was in that long pretty much by default – nobody else was willing to take the job on!). From the start, we were a caring congregation. We sent supplies to “Child Haven”, a children’s shelter group in India, and we adopted a local needy family each year for many years. We visited Cooper’s home for the Aged in Frenchtown regularly. When our elderly member Grace Massey could no longer drive to church, we took turns providing her with transportation. And of course, someone was always there with a casserole or pot of stew if a member or friend had a sudden emergency (or a baby!) whenever an oven-ready or easily heated hot meal waiting at home would be welcome. We held fundraisers: Festivals and service auctions appear to have dominated. An October fundraiser, which netted just over $900.00, was proclaimed a “great success”. Also, in our second year, we inaugurated a series of Sunday afternoon concerts followed by a traditional tea, which not only brought in outside money but also helped establish awareness of our presence in the community. And last but not least, we always seemed to need more space. Once we were in the church, the problem appeared solved for the adults. But our children were a different story. They met in the schoolhouse (where a fire had to be lit in the stove early in the morning in cold weather), and when that was no longer available to us, they had the use of a trailer for a year and another year the older ones met at a fire station. Despite our best efforts, we were never able to provide the adequate and settled quarters we wished for the children and more and more of them kept coming. So we talked and talked and always came up with the same – the only possible solution. Build we must, so “ok, here we go again!”. Our campaign titled “Capital Leap” was launched, and again people pledged (much more, by now) and we negotiated a new loan from Boston. And again we called in Paul Felder who designed the new building. And we called in a well driller and a septic system company. The first step taken by the latter was disheartening. The perc test was a total flop. I was there. They dug the hole, they poured in the water, and we went away for a while and then came back. There the water sat. Hence, our need to be very careful with water since it goes into a tank and must be pumped out. Somehow the septic system seemed to have a curse of some sort on it. John Crombie spent hours down in the trench working on the pipes. But finally it and the building were finished, and we held a dedication one Sunday after the service. Rev. Sue Henshaw, our minister at the time, began by calling John Crombie up to the podium and presenting him with a ceremonial key to what would “henceforth be known as John’s John”. We had a real restroom at last! So our third leap of faith had been successful, and our space problems were solved. But not for long. And not just for our children. Now we are again over-crowded. So it’s time for another leap of faith. Faith in our UU beliefs and way of life, for ours is not a Sunday-only religion. Faith in our ability to work together to provide a place in this area where like-minded people can learn about us and join us as so many of you have done.